While cruising through my local fabric store the other day, I found some khaki colored, cotton bottomweight fabric for sale. I realized that I didn't have any good, 'basic' skirts that I could wear into the office. That's where Ginger came in handy. I quickly looked up the yardage (I had the pattern already waiting to be used at home) and bought my fabric. I hadn't even opened the pattern yet, so when I arrived home I was so excited to find that it was only four pieces. Woohoo! Gertie skirt and my Pendrall blouse from a few months back. Fabric: Cotton Bottomweight. Used just less than two yards. 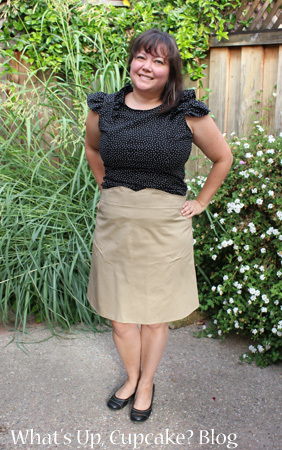 I whipped this skirt up in about three hours, from cutting out patterns, to hemming the last seam. I did include boning as I remembered Gertie had posted a tutorial as part of the first Ginger sewalong. The boning really helps the skirt waistband to keep it's shape. I'm definitely keeping this technique in my pocket for future projects. Also in that pocket? This skirt pattern! So easy and with great results! I can't wait to find more fabric to use for this pattern.